We all text more than ever before, with our family and with our friends. It’s time to expand the potential of texting and conversation to the way we interact with companies. The way we buy products, request support and make payments is about to fundamentally change. In the next few minutes I’m going to show you how this change impacts your business and what you can do to stay ahead of the pack using chatbots. Conversational Commerce represents a fundamental shift in the the type of applications we build. This is the biggest development since the arrival of the App Store in 2008. It allows you to have a bidirectional, asynchronous, real-time conversations with people, brands or bots that up until now seemed like science fiction. 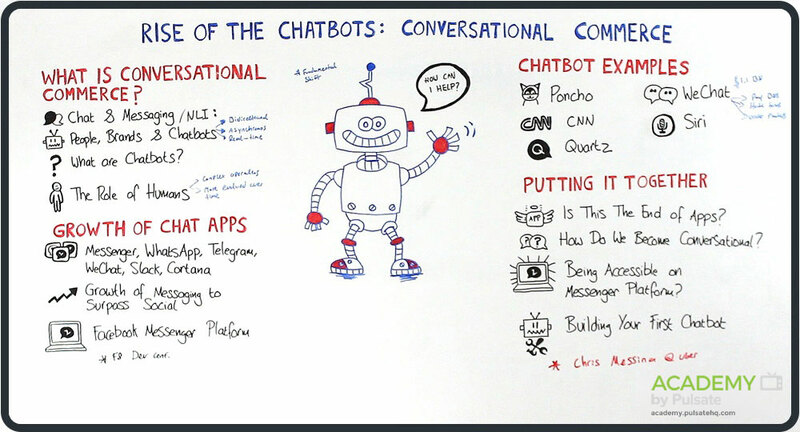 A chatbot is a computer program designed to simulate conversation with human users, usually delivered through a mobile App, or some kind of web interface. Chatchatbots often treat conversations like they’re a game of tennis: talk, reply, talk, reply. Conversational commerce does not specifically relate to the delivery of products or services by chatbots alone. Some companies are implementing conversational commerce purely using humans on the back-end to drive the service. I predict in the short term that chatbots will be used for handling simple queries / orders, then handing over to a human for more complex operations. Chatbots will become more evolved over time, to the point where they can handle almost any task. It will also become difficult to tell if you are taking to a human or chatbot. The result is that by the end of this year, talking to brands and companies over Apps like WhatsApp, Facebook Messenger, Telegram and Slack will be completely normal. We all know chat apps have been growing in popularity, if you use Messenger, WhatsApp, Slack or a combination of the above you’ll know how easy it is to communicate with friends and family. The growth of messaging apps like: What’s App, WeChat and Messenger have been absolutely staggering now completely overtaking social apps. One of the things that can make conversational commerce so appealing to businesses like yours is the massive audience available on these platforms. If FB Messenger has 900 million users, there is a good chance your customers are there too. In the last few weeks at Facebook’s annual developer conference (F8), Facebook have announced Messenger platform which is the API and tools you need to be able to have a direct line with your customers. Now they can message you directly as if you were friends or family. There is now a new category on FB Messenger called “Bot’s and Businesses” meaning you can publish your company there, it’s kind of like an app store for conversational commerce, and start having conversations with customers. You can decide to man the conversations manually, or if you like, you could create a bot to automatically talk to customers. So let me give you some examples of initial bots created by Facebook and their launch partners. Poncho the weather cat is an automated chatbot that I can search for and add through Facebook messenger. I start off by saying hello, poncho greets me by name, asks for my location and starts giving me weather tips. He’s trained to do this in a fun and friendly manner. I can stray Poncho away only slightly when it reminds me that she’s only a weather cat and can only help me with such things. So now that we’ve seen how utility can be delivered via chatbots, lets take a look at how publishers can use them to drop relevant content into my favourite chat app. I can now add CNN to my FB Messenger, it opens with a ‘Hi there, let’s get started, I’ll send you top stories every day. It lets me know I can reply with certain keywords to see related stories, or tap one of the buttons on each card to see more. I have to say these cards, and button options do not seem well designed. I’d like to show you an example of a publisher that has executed this in a more polished way. For now, its not available on your favourite chat app. If you want to experience Quartz in this way you’ll have to download it as a standalone app (I think it’s only available right now for iOS, sorry Android guys). With Quartz, I love the UI… it really feels like I’m having a conversation with a friend. As the news stories flow in, it makes me feel as though there is someone on the other side typing this in. I can’t type my own replies as free form text, instead I get multiple choice buttons that tells the bot if I want to know more about this story or skip to the next. It might seem limiting that I can’t type in my own text, but tapping the pre-made response buttons feels very natural, effortless, maybe even better than having to type. China’s WeChat, for example, generates over $1.1 billion in revenue by offering its 440 million users an all-in-one approach, letting them pay their bills, hail taxis, and order products with a text. If you have an iPhone, you may not have realised it but you already have a pretty advanced chatbot or agent. Siri allows you to make calls, compose text, play music and preform other routine operations. One the the problems though with Siri being adopted fully, is that the input is verbal. This inherently comes with a few drawbacks in that a lot of the time she misunderstands your input, lowering your confidence in using the service. The second disadvantage of verbal/ audio interface is that you don’t always want to voice your requests in public. You can imagine the looks on a packed train or something. Hi Siri what does the weather look like tomororow? Text is more natural as you don’t hear an artificial voice, more private as you are not making speech commands and sounding weird in public. Is This The End of Apps? In a way yes. I think this is the beginning of the end, for some apps. Not all apps. I think a lot of apps out there are very shallow in terms of the utility and value they provide. Over time, I predict that these apps will be better served by natural, more conversational interfaces. You will still need to ‘go deep’ with certain apps. For example you will need to use Spotify to easily browse playlists, you will still use instagram to consume the content and have more of an immersive experience. How Do We Become Conversational? You can become conversational straight away, there are a variety of plugins for your website and mobile app that allow you to talk directly with customers. Once such plugin is Pulsate Converse, you drop it directly into your mobile app and it creates a seamless What’s App like experience between you and your customers. Being Accessible on Messenger Platforms? If you want to take the next step and become conversational beyond your own web or mobile product, you’ll need to register for access to the Messenger or What’s App platform. This will give you API access allowing you establish a real-time connection between your CRM and the communication happening in the chat app. In the above example you are still driving the conversations through human interaction. If you want to experiment further, you could have a chatbot reply to customers using the same API instead of the CRM. Or maybe the chatbot does the initial talking, handing over to a human for more complex questions. Chatbots are essentially glorified IF ELSE statements, meaning in code that if we see X question we give Y answer. There are a range of tools out there that you can use to start creating basic chat bots, some of which are open source. I’ll be leaving links to these below so that you can check them out there. I also know from talking to my head of product there are plans to add some chatbot functions to Pulsate Converse in the near future. I’d like to acknowledge Chris Messina over @Uber for coining the term Conversational Commerce, and creating an exceptional post on medium that has inspired me to shoot today’s episode. I’ll leave a link below to Chris’s post. So that’s it for this video guys. Don’t forget, when you leave a comment below the video, you inspire the whole community. If you haven’t already done so, subscribe to my weekly mobile strategy hacks – never miss an episode.